Just try to feed me something other than seeds -- I dare ya! Parakeets need variety in their diet for sufficient nutrition. Parakeets are notoriously picky, though, and if your feathered friend is used to eating seeds, she won't willingly eat the pellets you offer her. Have a plan when making the switch to increase the chances she'll accept pellets. Always consult an experienced veterinarian regarding the health and treatment of your parakeet, like when you're considering switching her to pellets from seeds. Any change in your bird's routine can be stressful, and that includes changing her food. 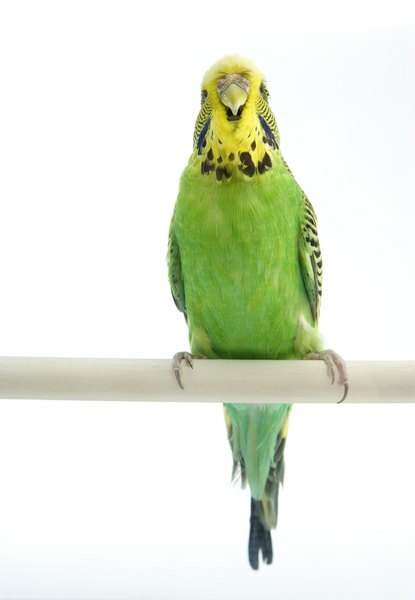 Stressing out a healthy parakeet is dangerous enough, but adding stress to a bird who is already sick or weak multiplies the risks to her health. Get the green light from your avian vet to make the switch and get a recommendation from him on which brands of pellets are nutritious. Your parakeet is set in her ways when it comes to her food, so don't try to feed her seed one day and pellets the next. Most parakeets will starve before spontaneously switching to an entirely different type of food. The best way to get your parakeet to try pellets is to mix them with the seeds she's used to eating in a 50-50 combination. Put the mixture in the food dish she's used to eating from, and empty out any uneaten food right before you go to bed. If your parakeet hasn't been indulging in late-night or early-morning snacking, she'll be hungry for the food you put into her empty dish in the morning and may be more inclined to give the pellets a try. Even though a quality pellet recommended by your vet will be nutritionally valuable, you should still give your parakeet a number of additional foods to bring variety and balance to her diet. Give your little feathered one fresh and dried fruits and vegetables like apples, grapes, carrots and peas. Sprouted seed is an option for providing food alternative to seed. Technically, it is a seed, so many times parakeets who are seed junkies will take to it more readily than other foods. When you're conditioning your parakeet to eat pellets you should decrease the amount of seed you give her each week while increasing the amount of pellets. This can stretch out up to five weeks, but by then your parakeet should be willingly eating the pellets. Examine her dish at the end of each day before you discard whatever might be left over. If she's only eating the seed and leaving the pellets you shouldn't reduce the amount of seed just yet, because you'll be reducing the amount of food that she'll eat. If the pellets are gone from the dish, make sure your parakeet isn't simply tossing them out onto her cage floor or plunking them into her water dish. Look for signs like partially eaten pellets or crumbs. When you're sure your parakeet is eating the pellets, you can feel confident in reducing the amount of seed you give her and increasing the number of pellets. Do this until her diet is 70 percent pellets and seed makes up only a portion of the other 30 percent. Parakeets; Nikki Moustaki, et al.